What can you say about a person who knew from a very early age that her destiny lay in leading others to greatness? Creative? Yes. Born leader? Yes again. Free spirited thinker? Yes, yes, yes! She is also direct, funny and full of mischief with bright blue eyes and a wicked smile! Gurutej told her mother just that when she was six years old. In 1969 Gurutej met Yogi Bhajan. Bhajan who is credited with bringing Kundalini Yoga here to the United States. As one of his original students, Gurutej emerged as a founding practitioner of Kundalini. 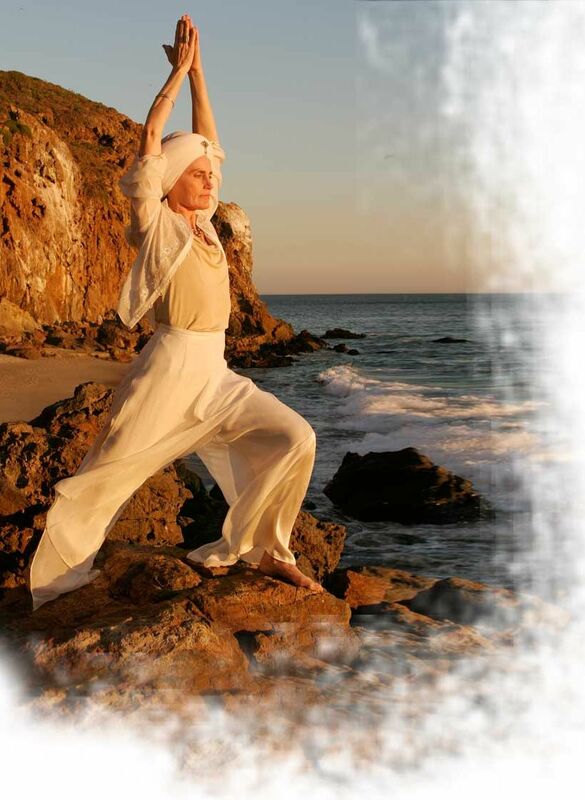 Through his instruction and spiritual guidance, Gurutej is considered a foremost authority on Kundalini Yoga and internationally recognized as one of a handful of Kundalini Yoga Masters. In 1970, Gurutej co-founded 3HO Canada. She ran 3HO for 17 years, where she facilitated the duplication of the successful yoga centers throughout the Canadian market and participates in helping take 3HO worldwide. Gurutej’s obvious head for business did not overshadow her commitment to Toronto’s children, which is why she introduced yoga to surrounding communities by teaching staff at Toronto General Hospital and students at The School House and The Alternative School. A co-founder of The Golden Bridge Yoga Center in Los Angeles, Gurutej, now practices out of The Blessings Center in the same market since 1999. As a mother, her greatest achievement is in successfully raising two dynamic and consciously aware adult children, Amrit and Pritham who like Gurutej, take great pride in their commitment to making the world a better place. Gurutej is an artist, exhibiting her first gallery showing for her paintings and mixed media in May 2003. A prolific writer and media contributor, Gurutej is the subject of much media attention. She has been featured in/on Vogue, L.A. Yoga, Yogi Times, Fit Yoga, Common Ground, Splendora.com, The Discovery Channel and MTV. She was awarded Yogi Times’ July 2003 Service Award and Teacher of the Month for August 2003. Gurutej has released over a dozen instructional yoga videos Two , Chakra Yoga and Awakening the Intuition for women have been listed on the Top ten yoga Videos of all time.